A note paper is a common paper product used to write notes. With the note paper, you can always write down a note, summery, telephone numbers, and a cue on which later note and review for reminding others or yourself some trivial but important things. 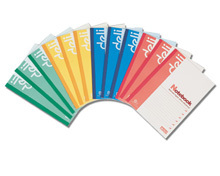 As an experienced note paper manufacturer in China, we at Deli Stationery also provide stick memo, fax paper, carbon paper, copy paper, etc., in addition to our note paper. As our paper products are reliable, economical and easy to use, they are very popular in many countries, such as Japan, the USA, Canada, Australia, Russia, Britain, Germany, Italy, France, and so on. If you are in need of our office supplies, please contact us immediately. Thank you! Whiteboard1. Our whiteboard, whose functions are similar to blackboard, is suitable for teaching, conference discussion. Specialized whiteboard marker should be used. Calendar ShelfAs we all know, calendars play an important role in our daily life. They can help people manage their personal schedules, and activities. As some calendars are simple, monotonous, and are inconvenient to flip, you may usually ignore them.